In the comics, Charles Xavier has been bald since grade school - the movieverse obviously didn't go that route. In fact, one of the running jokes in X-Men First Class was Chuck being protective of his hair (and in the sequel, he's rocking locks like Gambit). 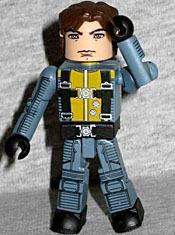 Retro Prof. X is played by James McAvoy in his second comicbook role, and the likeness on this figure is just non-distinctive enough to pass for him. The body below the neck is the same as Magneto's, but that's fine: it's supposed to be a uniform, after all, so why not use the same paint masks? Besides, the more often they're used, the cheaper they are; and with designs as complex as this, that can only be good. In the movie, Sebastian Shaw was played by Kevin Bacon, and he's recognizable in this figure. He gets new hair with big sideburns and is wearing a black suit with a white collar peeking out. In the comics, his mutant power allowed him to absorb kinetic energy and turn it into strength; in the movie, he could absorb any energy at all to create his own explosions. Which also somehow kept him from aging? Go figure. Of course, due to the way Minimates are made, you can give him Magneto's helmet if you want (though it does sit a little high on his head, thanks to the chest cap). 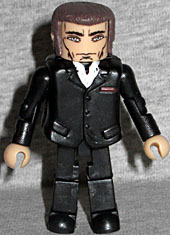 Xavier may not be a very exciting figure, but when the hell else are we ever going to get another Sebastian Shaw toy of any kind?